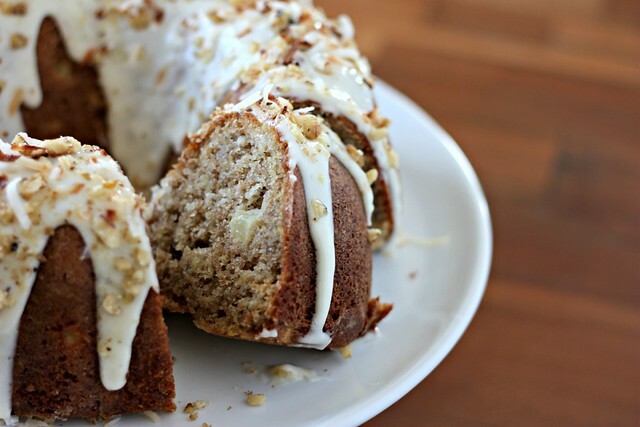 Hummingbird Coffee Cake – Elly Says Opa! About 5 years ago, I got the idea to make an angel food cake for the first time, even though I’m not a huge angel food cake fan. I also decided to try and add a raspberry ribbon in the center. And since I didn’t have an angel food cake/tube pan, I went to buy one. Only, the store didn’t have one, so I ended up with a bundt pan. (Probably) needless to say, that angel food cake did not turn out well. And, I haven’t used the bundt pan since. Instead, it’s been taking up valuable kitchen cabinet real estate where more useful things, like tart pans, could go. I rarely have a reason to make coffee/breakfasty type cakes, and until recently I didn’t really have coworkers to bring baked goods to so I wouldn’t eat them all. It seemed like time to bust out the bundt pan. I searched my google reader for bundt recipes I’d starred, and this one popped up. It was perfect because I had exactly 2 oz. of cream cheese left and it used shredded coconut—and half a bag of shredded coconut has been sitting in my freezer for an eternity. I had all the other ingredients except the pineapple, and I just used canned tidbits for that rather than fresh, which worked fine. This cake is pretty awesome. It’s incredibly moist, both from the yogurt and the mashed banana. 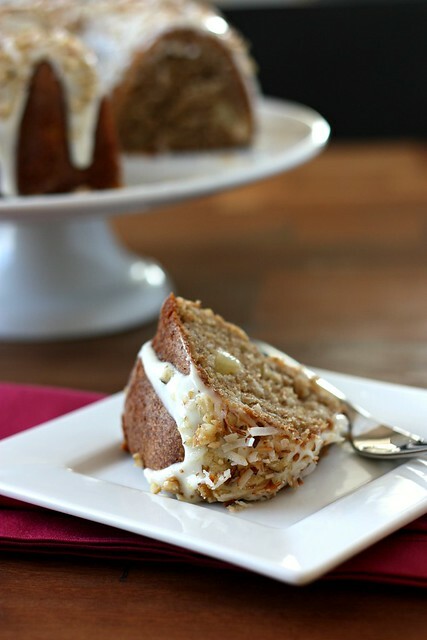 Coconut and pineapple pair beautifully together (hello, piña coladas) and cream cheese frosting should be its own food group. One thing I did sort of fail at, though, was bringing baked goods to my coworkers. This cake was just too good to share, so Tom and I have been eating a piece of it for breakfast every morning. Hey, if the word “coffee” is in the title, that means cake is totally acceptable for breakfast consumption. Preheat the oven to 350 and thoroughly grease a bundt pan. Coat the inside with flour, tapping out the excess. In one bowl, whisk together the flours, baking powder, baking sofa, cinnamon and salt. In the bowl of a stand mixer, beat the butter and sugar on medium-high speed until light and fluffy, about 3 minutes. Mix in the eggs one at a time, followed by the vanilla and coconut extracts. Beat in the yogurt until just incorporated. Turn the mixer to low, and add half of the flour mixture, until just mixed in. Beat in the bananas, followed by the remainder of the flour mixture. Using a spatula, finish mixing in any flour not yet incorporated, and then gently fold in the coconut and pineapple. Transfer the batter to the prepared pan and smooth the top. Bake, rotating halfway through, until a toothpick inserted comes out clean, about 45-55 minutes. Place the pan on a wire cooling rack and cool for 20 minutes. Using a knife, gently loosen the sides of the cake from the pan, and then invert the cake onto a cooling rack and allow to cool thoroughly. To make the glaze, mix together the cream cheese, milk, vanilla extract and confectioners sugar. If the glaze is too thin, add a bit more sugar. If it’s too thick, add a teaspoon of milk at a time until you get the right consistency. 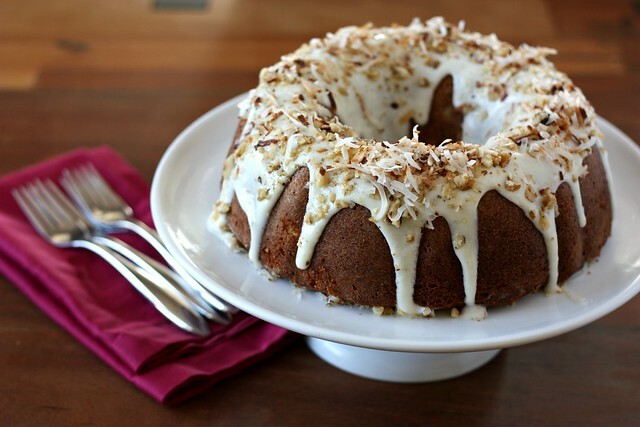 Pour the glaze over the cooled cake, and top with the coconut and chopped nuts. Allow the glaze to set before serving.